The Paxiom Group represents a number of the world’s leading food packaging machine manufacturers and offers a variety of products. Our food packaging machine models are categorized into two sectors; Technologies and Industries. First, we will be discussing the food packaging machinery that we are using under Technologies category. To begin with, Paxiom Group has a number of high-end automatic flow wrapping machines. Used for packaging an expansive scope of products, mainly food. The one and only famous SleekWrapper brand is the supplier of this packaging machinery in our company. Flow wrapping involves a horizontal packaging process wherein products to be packed are put inside the machinery and are wrapped in clear or printed film. The end-result would be a tightly fitted (but flexible) package. To finish, a horizontal back and a vertical top/bottom seal are also added after the completion of the packaging process. 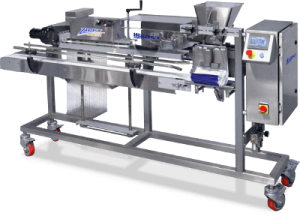 SleekWrapper’s product line includes an entry-level flow packaging machine named Sleek-40. If you are looking for a faster and wider range of packaging, SleekWrapper has more advanced models like the Sleek 45, Sleek 46 and Sleek Inverted. Another packaging system under this product line is the Breezy Bagger, which we will be discussing next. Finally, we are down to what we call the Breezy Bagger, a machine specifically used for manual loading packaging. Originating from the well-known high-quality SleekWrapper brand. The Breezy Bagger is made in such a way that the process of horizontal wrapping and vertical bagging are combined into just one compact machine. The Breezy Bagger has a unique attribute of a remarkable pivoting feature that is commonly required in many food packaging applications like automatic bagging and product loading, both in the vertical position, and for products requiring over wrapping including trays and containers in the horizontal position. Moreover, the Breezy Bagger also features an impressive length detection sensor and operational logic that will regulate the production of bags based on the length of the product. Thanks to the increase in productivity when using this machinery, an operator can now get the most out of it. Produce a consistency rate far exceeding manual labor.